The Milwaukee Brewers optioned pitcher Brandon Kintzler to Class AAA Colorado Springs and released Chris Perez outright. The moves leave the Brewers with Tyler Thornburg, Michael Blazek and Rob Wooten still battling for a couple of spots in the Brewers bullpen with just a week before the regular season opener against the Colorado Rockies (Aug. 6). In eight spring appearances, Kintzler posted a 6.48 ERA over 8 1/3 innings. Opposing hitters were batting .325 with 13 hits. The Brewers would like Kintzler to return to form, but it’ll have to come in the minors. His best season was in 2013 when Kintzler posted a 2.69 ERA in 71 appearances. He struggled last season while pitching with a sore knee that eventually required surgery. On the field, the Brewers were blanked by the Oakland A’s 7-0 yesterday. They’ll take the day off today. The Toronto Blue Jays scored five runs in the sixth inning and went on to beat the Milwaukee Brewers 9-5 at Miller Park. The Blue Jays earned a split of the two game series and put an end to the Brewers five-game win streak. Starter Jimmy Nelson (2-4) took the loss, allowing four runs on nine hits in 5 2/3 innings. When the Brewers went to the bullpen, Zach Duke allowed back-to-back hits and Brandon Kintzler came in and served up a three run home run to Jose Bautista. Nelson saw his streak of five straight quality starts come to an end as well. 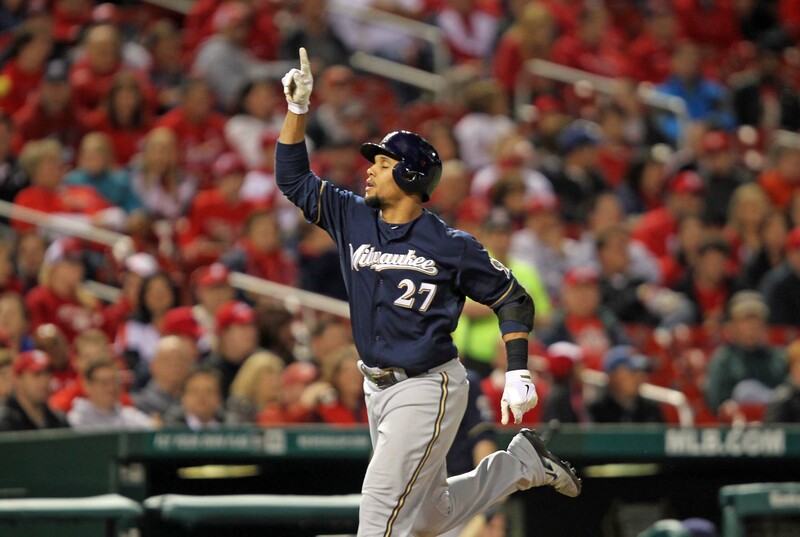 Carlos Gomez clubbed a two-run homer in the bottom of the sixth to once again make it a two-run game. But the Brewers couldn’t convert scoring chances in the 7th and 8th innings and Toronto’s Colby Rasmus’ two-run homer in the ninth off of Will Smith sealed their fate. R.A. Dickey earned the win for the Blue Jays, who pounded out 15-hits off of Brewers pitching on Wednesday. The Brewers finished interleague play with a 11-9 record against the American League, but a 1-3 mark against the Blue Jays. The Brewers get the day off today, then open a 3-game weekend series against the Pittsburgh Pirates. Yovani Gallardo (8-6, 3.32) pitches for Milwaukee. Jeff Locke (4-3, 3.73) gets the nod for the Pirates. The Milwaukee Brewers were swept in a series for the first time this season, falling to Toronto 7-4 on Wednesday. Edwin Encarnacion clubbed a game-ending, three-run home run with two outs in the ninth inning, handing the Brewers their third straight defeat. The Brewers had not been swept in 27 series before the 2-game series in Toronto. Only the Los Angeles Dodgers have not been swept this season. Jose Bautista and former Brewer Juan Francisco also clubbed home runs for the Blue Jay’s, who have hit a major league leading 113 home runs already this season. Wily Peralta came into the game riding a 5-game winning streak but surrendered four runs and nine hits in six innings. Peralta walked three and struck out four but wasn’t involved in the decision. Brandon Kintzler served up the game winner, but the loss goes to Will Smith, who put the first two runners on base in the 9th. It’s the 26th home run of the season for Encarnacion, who is tied for the Major League home run lead with White Sox rookie Jose Abreu and Baltimore’s Nelson Cruz. The Brewers are off today. They’ll open a 3-game series in Cincinnati on Friday night. When the Milwaukee Brewers score four or more runs, they usually win. In fact, entering Tuesday nights game against Arizona, the Brewers were 18-0 when scoring four or more runs in a game. The streak was bound to end at some point, and it did last night. The Brewers scored five runs, but it didn’t matter. Arizona clubbed three home runs and beat the Brewers 7-5 at Miller Park. The Diamondbacks tied the game 5-5, then won it with Aaron Hill’s two-run homer in the 3-run 8th inning. The Brewers became the last team in the Major Leagues to lose a game when scoring at least four runs. Marco Estrada worked six innings, allowing four runs but left with the lead. It was the bullpen that failed the Brewers this time. Brandon Kintzler took the mound and gave up Miguel Montero’s run scoring single, followed by Aaron Hill’s long ball. Kintzler also served up Brandon Phillips game-tying home run in Cincinnati’s extra-inning win over the Brewers on Sunday. Since returning April 23 from the disabled list, Kintzler has allowed three home runs. Arizona’s Josh Collmenter allowed all five runs (4 unearned) in the first inning but the Brewers couldn’t knock him out of the game. Collmenter held the Brewers in check from that point forward, before turning things over to the bullpen in the 7th. Marco Estrada worked six innings but tweaked a quadriceps muscle fielding a bunt in the fifth inning but stayed in ghe game. The Brewers will send Wily Peralta (4-1, 2.04) to the mound in the series finale this afternoon (12:10pm). Bronson Arroyo (2-2, 6.03) goes for Arizona. The Milwaukee Brewers open a three-game series against the rival Chicago Cubs at Miller Park tonight. Matt Garza (0-2, 4.50) faces one of his former teams when he takes the mound for the Brewers. Former Brewer Carlos Villanueva (1-4, 10.93) will face his former team. The Cubs are coming off a 4-game split against Arizona at Wrigley Field. 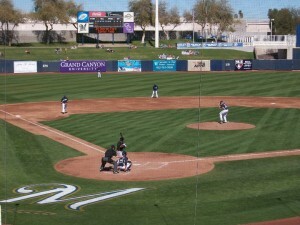 The Brewers had the day off yesterday, after they took 2 of 3 from the San Diego Padres. The Brewers on Thursday, reinstated reliever Brandon Kintzler from the 15-day disabled list and optioned reliever Alfredo Figaro to Class AAA Nashville. Kintzler has been nursing a strained right rotator cuff. He has not allowed a run in five previous outings for the Brewers this season. 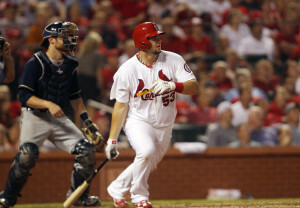 tight game with a four run eighth, beating the Milwaukee Brewers 5-1 at Busch Stadium in St. Louis. The Cardinals won their fifth consecutive game to maintain a one-game lead over the Pittsburgh Pirates and a three-game lead on Cincinnati in the NL Central. Milwaukee right-hander Yovani Gallardo pitched seven shutout innings to lead the Brewers to a 4-0 win over the Pittsburgh Pirates at PNC Park last night. Gallardo allowed 6-hits, walked only one and struck out five as he improved to 10-9 on the season. Gallardo has now allowed just two earned runs in his last 19 1/3 innings. Aramis Ramirez clubbed his second home run of the series in the 4th inning. Reliever Brandon Kintzler worked the final two innings to preserve the victory and the shutout, which was the 12th of the season for the Brewers. The Brewers return home to host the Angels tonight. 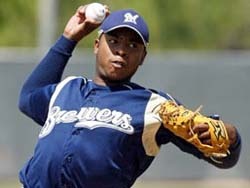 Wily Peralta (8-13, 4.51) pitches for the Brewers. The Angels counter with Jered Weaver (8-7, 3.46).